As for the question of the dark spots, a slightly snarky but apparently well-informed poster on GardenWeb forum had the following to say. Digdug:I believe your peaches have peach bacterial spot, although if you Google this term and “peach scab”, you will find the two diseases difficult to distinguish. After years of wrestling with this distinction, I more or less concluded that bacterial spots are usually spread farther apart, as yours are, often beginning on the lower part of the peach, and are darker in color. I believe that peach scab usually begins at the top of the peach near the stem, then spreads outward, eventually forming a solid mass.I have had both of these diseases many times, and both are highly damaging to peaches. Yes, you can still eat them, but it’s not much fun to do so, since you cannot even properly peel a peach with either of these diseases, which often affect the flesh to a depth of 1/4 inch or more. Many people peel peaches before eating, and peeling is standard procedure before freezing peaches, which is what happens to most of ours. While it is very important to try to prevent even minor damage to the fruits, in many cases the scab or spot spreads and stops growth of the peaches which of course is even worse. I wish you would not require us to guess where you live, but from the size of those peaches I have to guess somewhere in the coastal or interior Southeast. The rainy spring weather and early warming of the entire mid-Atlantic favors both of these diseases. Once these diseases are established on peaches, there is nothing to be done, since prevention is the key here, not cure. Application of bleach would be very unwise, and sulfur would not help at this point either. In fact, I believe sulfur to be useless against these diseases at any stage. Bacterial spot can also infect the leaves of peach trees, causing them to spot, turn yellow, and eventually fall off. The disease is also expressed by lesions on the limbs and twigs that exhibit sap leakage. Three or four years of unchecked bacterial disease can easily kill a peach tree. I have had pretty good luck with control of bacterial disease by applying two dormant sprays of a strong copper product called Kocide. Applications should be made in late fall, and again just before bud break. The most effective preventative that I have found against peach scab, which you will also no doubt see sooner or later, is a good spray of Daconil fungicide immediately after shuck split, and another around a week later while the peaches are still very small. I have tried other fungicides, including Captan and Topsin, and they do not seem to work for me. No spray will be effective once the peaches begin to size up, because the diseases are already there, though you cannot yet see them. You don’t mention the variety of peach you have there, but most modern peach varieties are bred to color up red well before they are soft ripe, and can hang on the trees for over two weeks while bright red and still not be soft and sweet enough to pick. Commercial growers have discovered that consumers prefer bright red peaches, but still need a hard peach to ship. 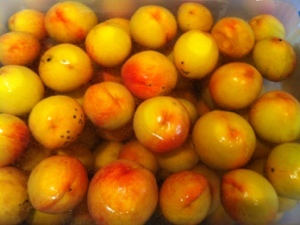 Truth be told, many yellow peach varieties taste much better than the highly colored reds. Color is not a good indicator of flavor. Finally, if keeping the “organic” faith is more important to you than growing good peaches, I doubt that you will ever grow decent peaches. There are some places in the country, mostly those that see warm dry weather during the growing season, that could pull off an organic peach, but not many of them are east of the Mississippi river. And so far we have talked only about diseases, not insects like the plum curculio and oriental fruit moth, which are normally present in the same areas that suffer from disease. Nor have we discussed brown rot, which often strikes later in the season. 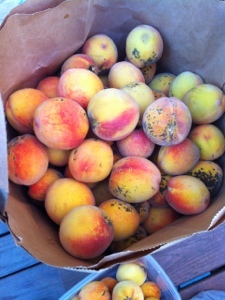 For the backyard orchardist, growing peaches is quite difficult, requiring all the help available from timely use of fungicides and insecticides. My experience is consistent with what this poster has to say. 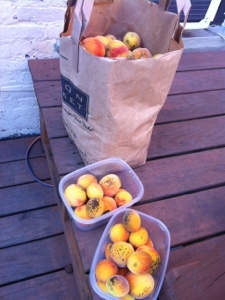 Having a peach tree out back is lovely (and unbeatably beautiful when in bloom), but it does require a lot of care and maintenance, and might not be the best pick for a backyard organic gardener like me. I’ll have to make some decisions about whether to continue to maintain the tree or let it go the way of the mystery dogwood/elderberry bush. I’ve had the tree for a good 7 or so years, and it’s been having solid productions since it was about three years old. The last couple years, though, the harvest has been getting slimmer and slimmer due to attacks by various garden variety pests and disease. I am open to suggestions, here… Go ahead! Gimme the dirt. 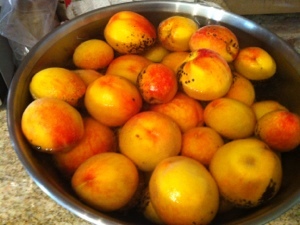 When I was small we had a peach tree out back. I was too small to remember much about it except loads of peaches falling to the ground. It is nice to just reach up and grab a fresh sweet peach. Not a solution to your problem, but maybe an interesting experiment would be to get a really ripe or over ripe peach and try to grow the pit/ seed. If I come across any information about peach problems I’ll post it.